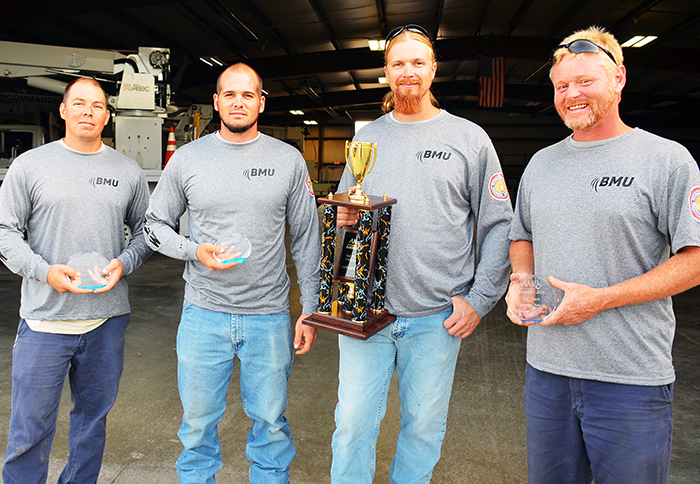 Bryan Municipal Utilities lineworkers received several awards at the American Municipal Power Lineworkers Rodeo competition held Saturday, August 27, at AMP headquarters in Columbus. More than 40 lineworkers competed in the rodeo, which featured three levels of competition: team, individual and apprentice. The events were designed to replicate actual lineworker tasks and to test skills needed on a daily basis. Events were judged based upon safety, work practices, neatness, ability, equipment handling and timely event completion. Lineworker Whit Longcore received Third Place in the Apprentice Obstacle Course, Third Place in the written test, and the Third Place Overall trophy in the Apprentice competition. “It was fun. It was a good experience – a chance to push my limits, test myself and learn some new things, and just figure out how to work quicker and more efficient,” said Longcore. In addition, the BMU Journeyman team of JJ Rupp, Brad Plummer, and Brandon Suffel received Second Place in 4kV Crossarm Change Out, Third Place in Hurtman Rescue, and Third Place in OCR (Oil Circuit Recloser) Change Out. The AMP Lineworker Rodeo mirrors the event held annually on a national level by American Public Power Association. Other communities participating in the rodeo this year were Cleveland, Cuyahoga Falls, Jackson Center, Piqua, Tipp City, Wadsworth, and Westerville in Ohio; Coldwater and Marshall in Michigan; and Central Virginia Electric Cooperative. RODEO WINNERS – The BMU journeyman lineworker team of Brandon Suffel, JJ Rupp, Whit Longcore, and Brad Plummer, from left, received several awards at the 2016 AMP Lineworker Rodeo held Saturday in Columbus.